AC35 @Bermuda: Smaller but Mighty Foiling AC45 might finally be the boat? Photo Sander van der Borch - If they end racing with the 45s how many teams we will end having? Alinghi? Red Bull own team? A Land Rover one? Muscat? Peyron's Energy ?? Hey I might tell Lange to put an Arg team too..!? Two weeks ago I wrote : "If the 45s were already one of the best designs ever made, the AC teams are transforming them in even better boats, right now there is not major weapon around in the sailing World than these modified ex floating cats...." Check article with backlinks to AC45 initial design concept. "The competitors and organizers of the 2017 America’s Cup are planning to implement a series of rule changes to dramatically reduce team operational costs, primarily by racing in a smaller boat. “After reviewing prototypes of the new AC45 sports boats being tested on the water over the past several months, it is clear that if we raced smaller boats in 2017, we could dramatically reduce costs without sacrificing any of the spectacle or the design, engineering and athletic challenge fundamental to the America’s Cup,” said Commercial Commissioner Harvey Schiller. “We have a responsibility to think of what is best for the long term health of the America’s Cup as well as improving the value equation for team principals and partners. Racing a smaller boat in 2017 and beyond is a big step in the right direction. early last year at a Competitors meeting in London but at that stage only ORACLE TEAM USA and Emirates Team New Zealand were in favor of using a smaller boat. 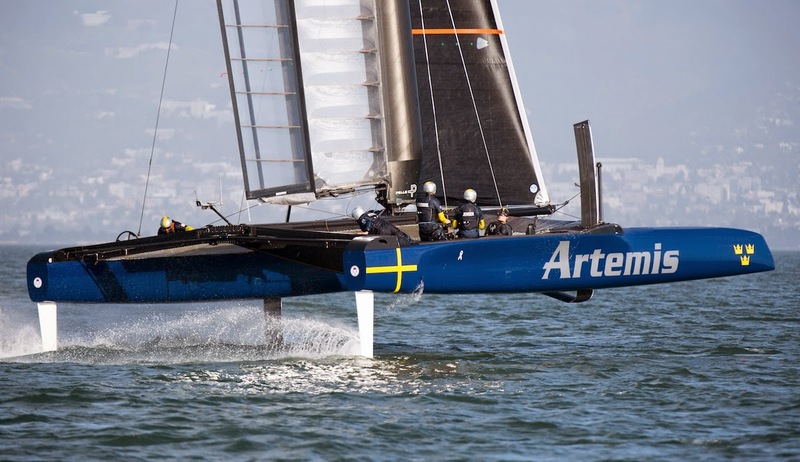 Boat speed in the new boat is expected to be similar to what was achieved in the last America’s Cup through increased time foiling and advances in design and engineering. To lock in the cost saving measures over the long-term several competitors, including Artemis Racing, have committed to using the new smaller class in the next edition of the America’s Cup should they prevail in this one. “These changes may help some current teams be more competitive, but this is clearly also about building the future of the America’s Cup,” said Iain Percy, the team manager of Artemis Racing. The rule changes are being drafted and teams will be asked to vote on these changes before the end of March."